Plants are a great way to liven up your indoor decor. Creative pots and other plant vessels bring out more of your style, and DIY planters are an even greater way to add a personal touch to your home. These easy, simple ceramic planters are a great beginner project and can be customized in any color. First, you'll need to decide what size plant pot you'd like to make. 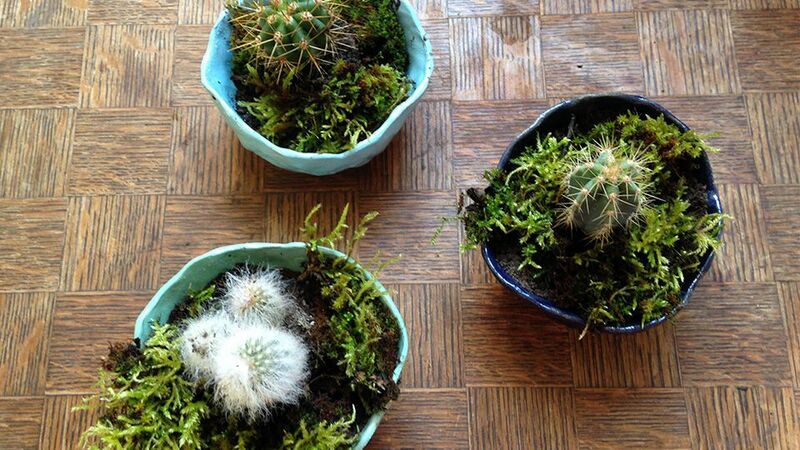 We made a collection of simple small plant pots for cacti. Cacti make for the ideal houseplants; not only are they trendy, but they're also extremely easy to care for. Once you've decided on the size, you'll need to make sure your clay is wedged–this means making sure all of the air is removed, so the piece does not explode in the kiln. After it's been properly wedged, you can roll it into a smooth round ball. When you're happy with your smooth round ball, push your thumb into the center of it. Make sure you don't push your thumb right through, as you'll need to have a base to your pot. This is the basis of a simple pinch pot. Once you've made the initial pinch, you might need to press both your thumbs into the center to open up the pot a bit. Continue pressing your way gently around the pot. The method shown here, using your index finger and your thumb, tends to work best. Try to make even pinches, so the width of the pot's edge is equal all the way around. Once you've pinched the pot and made sure it's as even as it can be, you'll need to smooth it down. You can use a small damp sponge or even your fingers to smooth it out. When you're completely happy with your pot, leave it out to dry. It's a good idea to make several of these pots at one time, so they can all sit out together. Since these pots are for cacti, which don't need much watering, we haven't added drainage holes, but keep in mind if you are potting plants that need more regular watering, drainage holes will need to be made in the base of the pot. Once your greenware (unfired pottery) is bone dry (completely dry), it's ready for a bisque firing. Bisque firing transforms the ware into a porous state for glazing, slowly drawing all the moisture from the clay at very high temperatures to turn them from clay into ceramics. After the pots have come out of the kiln and once cooled down, they'll be ready for glazing. We used different shades of blues and greens, but you can go with any color. These were glazed with three shades of underglaze, then painted with a transparent glaze to give them a good shine. After the glaze firing has cooled, they're ready for potting. These little plant pots make a great colorful addition to a room and also make great gifts.